That play worked for Pederson, just like just about every other play that he called on the day. There was going to be no holding back. For the Eagles to knock off the Patriots, who have made winning Super Bowls their thing, they were going to do it going all out. There was no playing it conservative and the results proved that out. The Patriots just couldn’t get off the field on third down. Philly was busy converting 10 of their 16 third down opportunities. And of the six third downs that they didn’t convert, the Eagles converted two fourth downs. What makes this story even greater is the Eagles once again played the underdog role and won and they did it on the biggest stage with their backup quarterback. Nick Foles passed for 373 yards and three touchdowns and became the first quarterback in Super Bowl history to pass for at least one touchdown and catch a touchdown pass. He naturally was named the games MVP. Foles was making plays all over the field and it’s a credit to his coach, who allowed for that to happen. The Patriots didn’t back down, answering Eagle scores with more of their own. The difference was the Patriots inability to convert yardage into touchdowns in the first half and they had plenty of chances. Just nine years ago, Pederson was coaching high school football. But he climbed quickly through the ranks in the NFL and now, here he is, a Super Bowl champion. Of course Wisconsin fans know Pederson’s story. Prior to his coaching stint, he was Brett Favre’s backup in Green Bay. He didn’t get to play much, because he played behind Favre, who was the NFL’s Ironman at the position. But Pederson studied the game. He watched Favre and helped him as well. 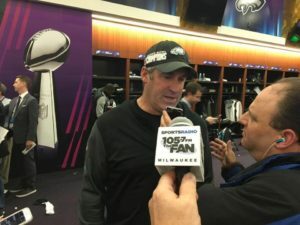 Pederson helped bring the Lombardi Trophy to Green Bay as a player. Now he helped bring the Trophy to Philly as a coach. Packers fans will go back to cheering for their own team, but when the Packers missed the playoffs, it was certainly a lot of fun to pull for Doug Pederson and he didn’t disappoint.